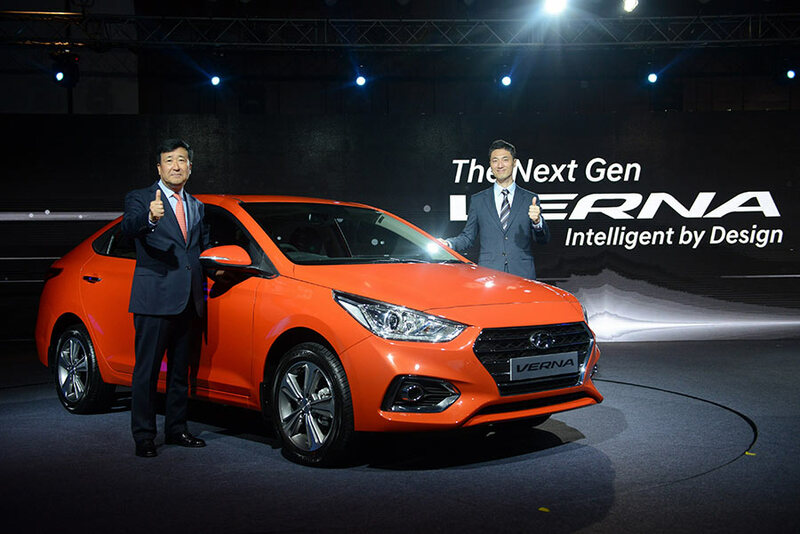 Hyundai Motor India Ltd, the country’s 2nd largest car manufacturer and leading passenger car exporter today, launched the much-awaited 5th Generation Super Performer Brand – The Next Gen ‘VERNA’. With over 8.8 million customers in 66 countries The Next Gen Verna is one of the most loved brand globally. The Next Gen Verna is ‘Intelligent by Design’, it is developed on four strong pillars: Futuristic Design, Dynamic Performance , Super Safety and New Technology & Advanced Features. The Superior performance of Next Gen Verna stems from vehicle’s SUPER BODY STRUCTURE built with 50% Advanced High Strength Steel (AHSS). The Next Gen Verna is ‘Intelligent by Design’ and an All-rounder car with Human Technology Connect comprising Futuristic Design, Smart Connect, Ingenious Detailing, Superior Dynamics and Super Body Structure for new age aspirational customers. The Verna brand has been a landmark product in Hyundai growth story winning many prestigious accolades worldwide. The Next Gen Verna is engineered to deliver excellence in all core areas of Styling, Performance, Technology, Safety and Ride & Handling creating a new benchmark in the sedan segment. The Futuristic exterior styling of Next Gen Verna is Sporty, Aggressive and Modern. The exterior styling elements of Next Gen Verna are inspired by Dynamic Expression. The front is defined by Hyundai’s Signature Chrome Cascade grille with horizontal chrome slats and chrome surround that projects bold, yet premium stance of the car. While the swept back Projector Headlamps with LED DRL enhances the sporty appeal it also ensures Superior illumination. The projector fog lamps with chrome surround ensures strong and focused illumination The side profile is designed with a sense of sporty & coupe like silhouette while the slopping window chrome beltline boosts style quotient. The modern dual tone rear bumper with black tone insert further enhances the dynamic and sporty appeal. The eye catching split type LED Tail lamps with LED guides give hi-tech and premium appeal to the rear. The Aerodynamic profile of the car along with Shark fin antenna and slopping roof line enhances the sporty appeal of the car. The aerodynamic design elements have increased the overall stability of the car and lowered the coefficient of drag to 0.308. The Modern and Driver oriented interiors creates a perfect blend of premiumness and convenience. The all new layout with attention to detail makes the interior feel more comfortable and spacious. The Driver- oriented center console along with ergonomically located controls provides an intuitive access with minimal distraction to the driver for comfortable and safe driving. Practical in-cabin storage space and enhanced boot capacity of 480 litres ensures that there is ample luggage space for comfortable family week-end trip. Built on All New K2 platform similar to Hyundai’s Global Bestseller Elantra, the Next Gen Verna offers a whole new level of ride comfort with smooth & precise handling, exceptional interior quietness and enhanced safety. The Superior Ride and Handling characteristics of platform are complemented by McPherson Strut Suspension in front and Coupled Torsion Beam Axle (CTBA) with Vertical Shock Absorber along with Hydraulic Rebound Stopper (HRS) in rear for improved damping, ensuring a comfortable ride and stabilized driving. Hyundai’s powerful, efficient and proven 1.6L Dual VTVT Petrol and 1.6L U2 Common Rail Technology VGT diesel engine offers powerful performance with low NVH, high fuel efficiency and durability for exceptional city and highway driving pleasure. In-house developed 6-Speed Manual and 6-Speed Automatic Transmission offer superb smoothness and better fuel efficiency. All Hyundai cars are developed, tested and built under the Hyundai ‘Safe-Drive Philosophy’. 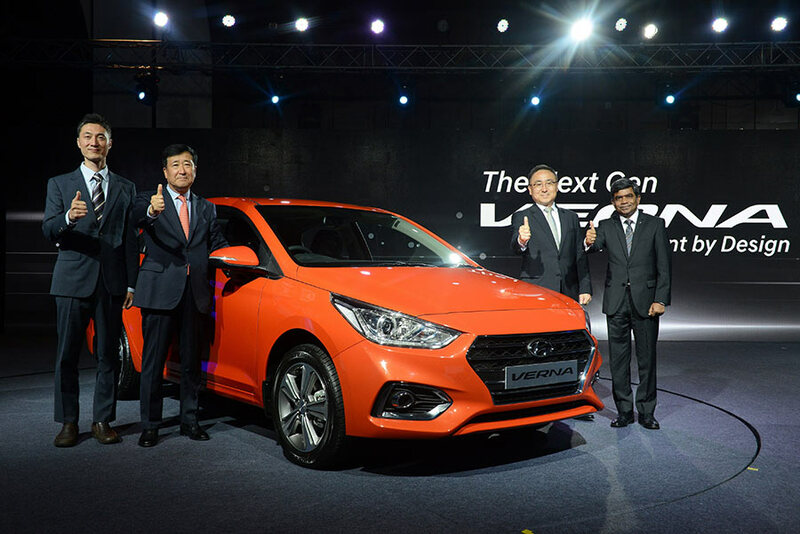 Beyond active safety technologies, Next Gen Verna is built to comply with Hyundai’s strict safety standards, helping it to meet the safety requirements. The SUPER BODY STRUCUTRE of Next Gen Verna is developed with 50% of Advanced High Strength Steel (AHSS), an additional 37% increase over the previous generation model. AHSS components are used to increase stiffness of chassis and protect passengers effectively in case of collision. The Hot stamping on door pillars provides cabin protection in case of side collisions. The Next Gen Verna offers a host of premium and Segment Unique Comfort Features such as Front Ventilated Seats (First-in Segment) for keeping seats cool in hot weather, Smart trunk (First-in-Segment) that automatically unlocks and pops-out when the owner stands with-in 1 metre behind the vehicle with smart key for more than 3 seconds and the new Electrically Controlled Smart Sunroof gives a sense of openness and premium ambience inside the cabin. The Next Gen Verna features advanced infotainment system with 7.0 IPS (In Plane Switching) capacitive touch screen – Audio Video Navigation System (AVN) with rear view camera improves driver visibility and functionality. Multimedia system is equipped with Apple Carplay, Android Auto and Mirror Link for seamless integration of app based navigation, streaming audio, voice controlled search capabilities and smartphone applications. For the first time, the Next Gen Verna comes with 6 speakers along with SMART SURROUND SYSTEM by ‘Arkamys’ delivering a music experience much closer to the artists original intent. The efficient cooling of the Next Gen Verna keeps its occupants cool, Comfortable and Pleasant while maintaining clean and healthier cabin environment. The Eco Coating Technology (World Premier) prevents unpleasant smell to develop in the AC Evaporator by degrading the micro-organisms developed in the AC Evaporator Core. The Eco coating technology ensures odour free and fresh air for a comfortable and pleasant journey. Hyundai Auto Link (New) is a dynamic new way to stay connected with your car. The vehicle health check, Driving information, Road side assistance, Driving History, Eco Driving and Vehicle Health history all can be checked with click of button. Hyundai vision is to be the Life time partner of its customers. We are always around and near to our customers. As a unique customer Experience, the Next Verna will be offered with Lowest Cost of maintenance and warranty with 3 Years Unlimited Kilometres, 3 Years Road Side Assistance, 3 times Map Updation and home visit on 15th Day of purchase for all the customers of Next Gen Verna. To match the Sporty and Dynamic characteristics of The Next Gen Verna, 4 new colours have been introduced making it an array of 7 exterior colours options with 12 Variants. Tata Motors' New Corporate Brand Identity - "Connecting Aspirations"